It’s being billed as the perfect Mother’s Day present, and for good reason. 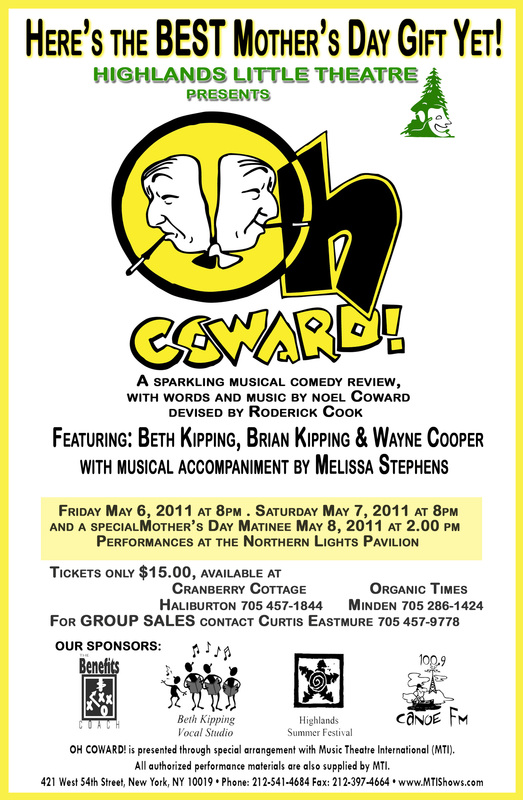 Oh Coward is a truly clever and engaging musical review. Who better to take on the challenge of this delightful score than Beth Kipping, Brian Kipping and Wayne Cooper. On the grand piano, accompanying this stellar cast is Mellisa Stephens. At $15.00 a ticket this is perhaps the most affordable Mother’s Day gift you can buy. Go for mom or go for the fun of it. It promises to be a sparkling spring event. The details are below … please forward this note to friends. They’ll be sure to thank you. Previous Previous post: Darned Kids! Next Next post: Variability of Communities. No Tim Horton’s here.